It's vital to have a well thought-out VBS budget in place to help pave the way for effective planning. It's also important to gather input and share the budget with the team to encourage transparency and good communication. A clear budget frees everyone involved to make wise decisions. Here are four steps for setting your VBS budget. It takes all different types of people to put together an excellent VBS—active administrators to keep your group on task, creative crafters to find the perfect hands-on activities, game gurus to encourage everyone to get up and move, and sweet snack helpers to find the perfect treats. As you assemble your VBS planning team, find a frugal financial manager to add into the mix. Choosing a volunteer with a solid financial background allows your other team members to focus on the things they love—without getting bogged down by budgets and numbers. Have your finance volunteer meet with each site leader separately as they determine their needs and wants for the coming summer. 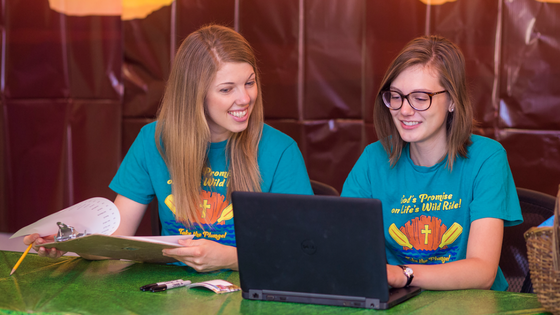 As your finance volunteer hears each site leader's list, they will see the larger picture and know what's needed for a successful VBS. They may see new opportunities for resource sharing and collaboration. Having one person in charge of the big picture encourages members to be good stewards of the resources they receive to help with VBS. How many children do you expect will attend? How many volunteers do you hope to recruit? How much would you like to spend per attendee and volunteer? What are your income targets and sources? What are your expense targets and how will they be distributed across areas? What in-kind donations will you receive for VBS? How might these in-kind donations affect your income and expense goals? After your goal-setting meeting, your financial coordinator should have all the information they need to start setting the budget. Every financial manager accounts for their budget differently. Some use an Excel worksheet like the one listed at the end of this post. Others choose to set their budget within their financial management software, like Church360º Ledger or Shepherd's Staff. Whatever means your financial manager uses to put the budget in writing, make sure that the format is simple and shareable with everyone on the team. Initially, some team members may be surprised to know specifics of the budget. However, it's good practice to keep everyone on the same page and to know expectations up front. Budgets are not meant to be restrictive but freeing. When team leaders know their budget, they can be more autonomous and have more control over the financial decisions they make for their area. 4. Get Creative with Fund-Raising and In-Kind Donations! With your team in the know about your income and expense targets, it's time to hit the ground running. Fund-raisers are great opportunities to support your VBS and make it an affordable (or free!) experience for attendees. In-kind donations are also a great way to help support VBS. Many people like giving something tangible instead of money. Think about what snack and craft supplies people can donate. See if members are willing to purchase student essentials like Passalong CD and DVD sets or T-shirts for a class or group. One final tip—when setting your fund-raising and donation schedule, coordinate with other ministry groups at your church. Having too many fund-raisers running at the same time can cause people to burn out easily or become less invested in each cause. Try targeting people whom you think are the most interested in supporting VBS rather than sending the same announcement to your entire congregation. People love to support causes they truly care about!